Flavowire has a list of the ten most powerful female characters in literature. The list is populated with recent works, which I think is a problem: Jane Eyre (Jane Eyre); Hermione Granger (Harry Potter); The Wife of Bath (Canterbury Tales); Katniss Everdeen (The Hunger Games); Hester Prynne (The Scarlett Letter); Eowyn (The Lord of the Rings); Lyra Silvertounge (His Dark Materials); Janie Crawford (Their Eyes were watching God); Hua Mulan (The Ballad of Mullan); and Lisbeth Salander (The Girl with the Dragon Tatoo). Some have argued that the character Bella from the Twilight series also should be included. Obviously, the word powerful is high suggestive and obviously the choices all reflect the various author’s view of power. Nevertheless, I wonder why these characters were left off: Offred (The Handmaid’s Tale); Lady MacBeth (MacBeth); Sofya (Crime and Punishment); or Elizabeth Bennett (Pride and Prejudice)? So what make’s a female character “powerful.” Is it her voice in the midst of a context that otherwise would mute her? (Offred) Is it the conflict that she engages in? (Lady MacBeth) Or, is it adhering to traditional female virtues while having a voice or demonstrating strength? 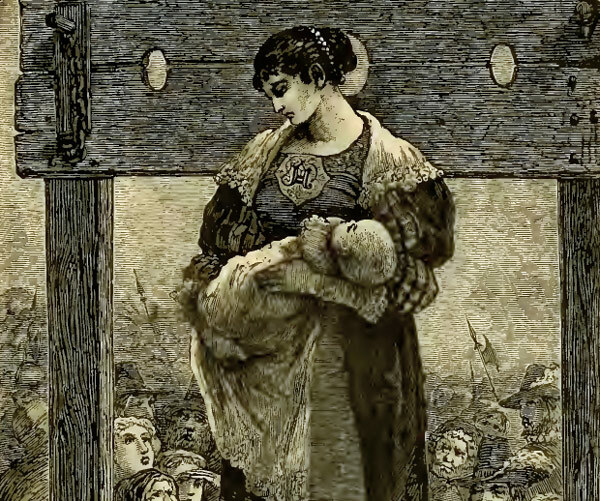 (Hester Prynne). The list referred to from Flavowire seems to place the most emphasis on physical strength. What do you think? What makes a female character powerful? Vote for who you think is the most powerful female character in literature. Post comments below. Bella? From Twilight? Who is suggesting her inclusion and on what basis? Her character is the opposite of powerful. She is literally incomplete and unable to care for herself without not one, but two males to protect her. Lisbeth Salander, however, I have no issue with, though, as you point out, she is quite recent. Just to note, it’s Macbeth. McBeth sounds like something McDonald’s would come up with. Ironically, while writing this piece, I drank a McShamrock Shake. Thanks for the catch.